Free books on tape are available from the National Library Service for the Blind and Physically Handicapped. They provide Free recorded materials through the Library of Congress. Talking Books Program - Who Is Eligible? 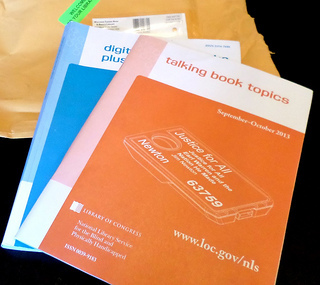 Books and magazines in audio form (talking books) are delivered to eligible readers by postage-free mail and are returned in the same manner. 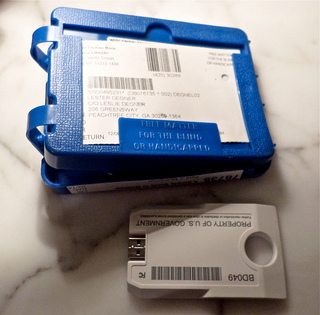 No need to every worry about paying shipping whether it's to receive your new books on tape or to return the tapes. Specially designed cassette players are also loaned free to persons who borrow talking books from their library. 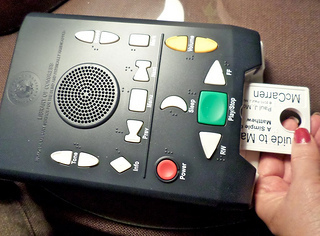 An amplifier is available for individuals with significant hearing loss. 1) Persons whose visual acuity, as determined by eye specialist, is 20/200 or less in the better eye with correcting lenses, or whose widest diameter of visual field subtends an angular distance no greater than 20 degrees. 3) Must be residents of the United States or American citizens living abroad. First contact the state where the person lives who has low vision or macular degeneration. In my case it was the Wisconsin Talking Book and Braille Library in Milwaukee. They will email or mail you a form that needs to be filled out. Return the form. 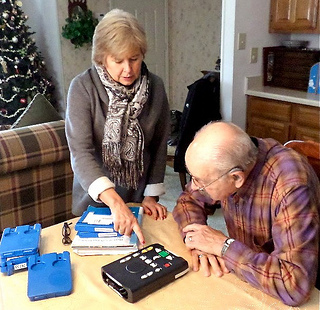 I called and asked if the digital player and audio books could be mailed to me (I live in a different state) so that I could show my father-in-law how it worked when he was visiting us. The cassette player or machine is loaned to the listener. Be sure to save the box it came in so that it can be mailed back free of charge when it is no longer being used. Large buttons make the play back machine easy to use. Simple buttons like Rewind, Forward, and Play are on the machine. Volume up or down are the large yellow buttons. There is a Sleep button that allows the player to set a 15", 30" or 45" timer so that the machine will automatically stop after the set period of time. My father-in-law likes this feature because he often falls asleep while listening to a book on tape. He also finds it easy to reverse if he wants to re-play a section or he can jump ahead if there is what he calls, "a boring section." When pressed, all of the buttons will state what that button is for. As an example, hit the Power button and the listener will hear, "Power On" or "Power Off." The machine can be powered either by electricity or by rechargeable batteries. So if you choose to sit outside on a warm sunny day, take it outside and listen to a your book on tape on your deck, patio or porch. Each book on tape comes as a cassette in a plastic case that is used for mailing. The cassettes are sent via the U.S. Post Office and are delivered right to your mailbox. 1. Match the number on the cassette with the number on the case. 2. Place the cassette back into the case. 3. 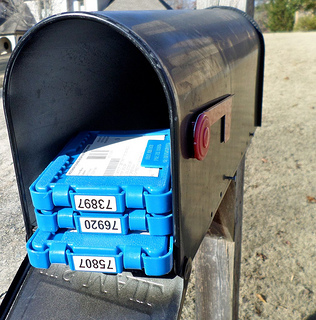 Turn over the mailing label so that instead of your home address the address to the Talking Book Library shows instead. 4. 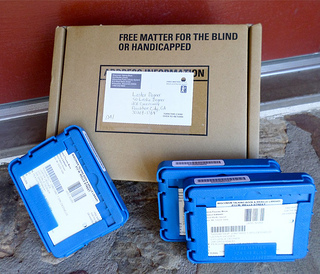 Place the plastic cases in the mailbox for free returns back to the Talking Book and Braille Library. There are several ways to order new free books on tape. The catalogs listing all of the available tapes are sent to the listener. The Talking Books program has a large selection and the catalogs categorize the books in sections - Nonfiction, Historical Fiction, Mystery, Short Stories, Suspense, Westerns, and Spies and Espionage are just some of them. You can also look up a book on tape by title or author. An order form in the back of the catalog can be filled out and mailed, faxed or e-mailed. My father-in-law found it too difficult to fill out the form so he simply called the Wisconsin Talking Book and Braille Library using their 800 number. Up to 10 books can be ordered at one time. Although this may vary from state to state. The books can be kept for 60 days, although there is no late fee if it is not sent in this time frame. Each state is serviced by a library that loans the cassette player and books on tape. You can request an application by calling 1-800-424-8567 or by going to the National Library Service for the Blind to fill out a form. Once your application is submitted and processed, a cassette player is mailed out and the book selection can be made by either the library based on your preferences or by specific request of a title or author.